When we found out about Medulla through a friend, we were immediately interested in engaging with this project, initiated by screen printer Davide Montorsi. Davide opened our eyes to the possibilities of environmentally friendly printing, and our Halftone Scarf Collection is the result. After months of research and trials, Davide has developed a collection of 100% organic, plant based inks. You often hear of "organic inks", but more than likely they are of organic origin and then mixed with chemical fixatives for printing, so not really 100% organic. Medulla's printing process is completely free of chemicals, obtaining a perfectly working organic dying process from beginning to end. We had been dreaming of creating our own silk scarves for a while, so when we stumbled upon Medulla we knew that it was the right occasion to produce something special. The pattern for our scarves uses a modular tile system, each printing tile filled with a halftone dot gradient. Each tile has been screen printed by hand on the fabric, much like block printing, creating a flowing layout of gradients and dots. Some of the tiles have been printed on top of others, creating overlapping which leads to intriguing visual effects. We used two colour dyes: black, obtained mixing Indigo, Chlorophyl extract and Madder, and brown, obtained mixing Acacia and Madder. We decided to use four silks of differing colours, to see how the different inks and fabrics would interact with each other. The results are very delicate, with each scarf and ink pairing leading to natural diversities when they are brought together. 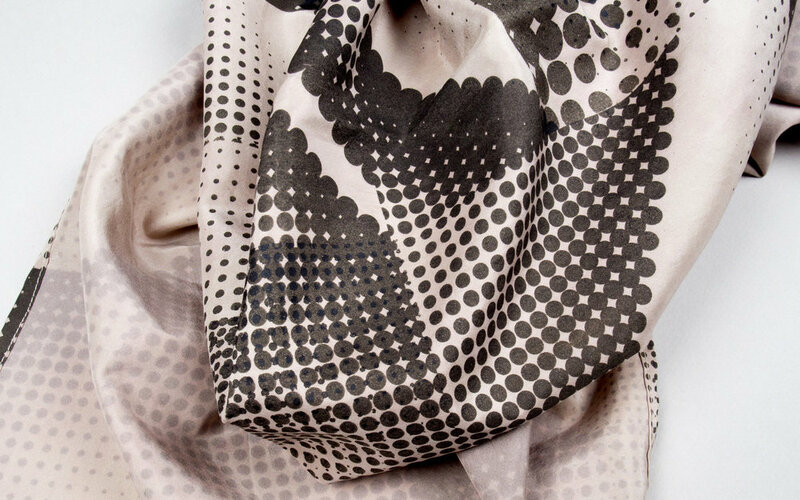 During the washing process, when the excess ink is removed, the remaining ink adds a layer of colour to the silk, with each scarf behaving slightly differently. It is this unique reaction that we love about this project, and the uncertainty and uniqueness to each finished scarf. We have four scarves available, all made of pure silk, but with different wave, texture and weight. Their colours are all slightly different, and each scarf edge has been hand finished. All four are unique pieces, with only one of each available, but if interested we would be happy to use our tile screens to create more scarves or other items.